A good gardening magazines is a great reward, best saved for when going apres-gardening, or enjoying the first morning cup of tea - when even the advertisements can look enticing. And those new plant releases - just heavenly! I love the British magazines for their romantic, softly fuzzy nostalgia. 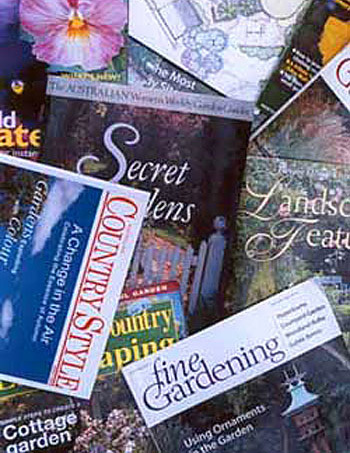 Australian gardening magazines are loud and colourful, representing their warm and vibrant country of origin. But my absolute favourite is an American magazine called Fine Gardening. I love all Fine Gardening's articles, and many of the plants it features become favourites in my own garden. I particularly love the foliage in the photographs, and the general tone and wisdom of the writers. Have a peep - you might enjoy it, too! This is the perfect winter garden magazine - there are lots of beautiful spring English gardens to stare at and enjoy. The colours are heart-warming, and give me hope - perhaps spring isn't actually that far away! This is the national magazine for general gardening in New Zealand. It has a variety of styles and attitudes, and sometimes seems confused - should it be a light read by the coffee table or an inspiring and informative experience? I had to include this magazine, not because I regularly read it, but because the very first Mooseys Country Garden was featured in it - taking up a quarter of a page of English country living space. I subscribed to this New Zealand gardening magazine until it ceased publication in late 2002. I really enjoyed its consumer test articles. There is only one magazine which regularly inspires me enough, and I really recommend it. It's American, and sadly is only published every two months. I have no hesitation in saying Fine Gardening is my most favourite gardening magazine.